The Rosary will be recited at 7 PM. C/O St. Augustine Cathedral, 542 W. Michigan Ave. He was the one who always went the extra step, served the need if it presented itself, and provided what was needed. 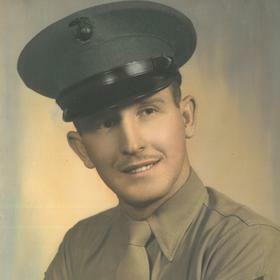 Gene Roy Roberts "Teapot" was a proud United States Marine and a devoted family man. He was always counted upon to greet others with his famous, "Have a good day now." Gene was patriotic through and through, as he proudly flew his American flag, and he always enjoyed life's gifts - even the simplest ones like fishing on a lazy afternoon or tending to his colorful flower gardens. His place in our lives will never be forgotten. Life in 1931 was not easy. Unemployment was facing record highs, and banks were still closing as a result of the Great Depression. Mother Nature did not take it easy on the country either, as there were many droughts causing horrific dust storms. Thankfully there were some brighter spots, as the United States government began cracking down on the mob, and mobster Al Capone was locked away in Alcatraz. Additionally, Americans watched as the Empire State Building reached completion making it a remarkably tall structure for its time. Life also offered a remarkable gift to Harry and Minnie (Olson) Roberts as they prepared to meet their precious baby boy. Gene Roy was welcomed into the world on August 3, 1931, in Kalamazoo, Michigan. When the family reached completion, four handsome boys inhabited the family home; Dale, Glenn, Gene, and Donnie kept their parents very busy. 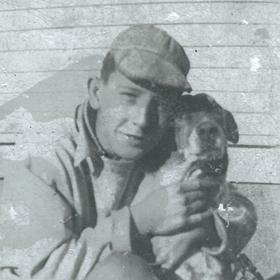 From early on in his life, Gene was an outgoing and social soul. He attended Kalamazoo schools where he made many friends and created wonderful memories. He even endured the walk to school and home, “up hill both ways" throughout his academic years (as he always told his children). 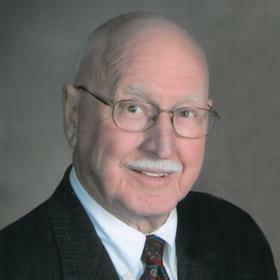 Eventually, all those walks provided the opportunity to earn a high school diploma when he officially graduated with the Kalamazoo Central High School class of 1949. Right away he began working for Michigan Colorplate as an apprentice photoengraver. It was not long, however, before he was drafted into the service. He chose to become a United States Marine. He began his service in 1951during the Korean conflict serving for 2 years. He was stateside in California, and also Japan. Upon his honorable discharge from active duty, he resumed working at Michigan Colorplate. He loved his job (rarely missing a day of work) where he worked for 46 years before retiring from a managerial position in 1995. With his hard-working attitude, it is a marvel that he had time for anything else, but then he met Cecelia. The two connected on a blind date in 1954. Gene arrived looking dapper right down to his mustache. Little did he know, she was not much impressed with his facial hair, but there was definitely a spark between them despite the mustache. She could feel in her heart that he was a good person. In time, they worked out all the finite details of their love and planned a wedding. 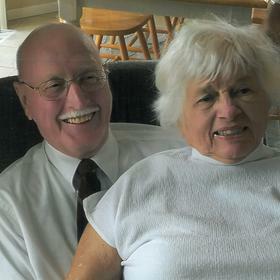 They were married on May 14, 1955, at St. Mary's Church in Paw Paw. The happy couple traveled up north to enjoy their honeymoon. 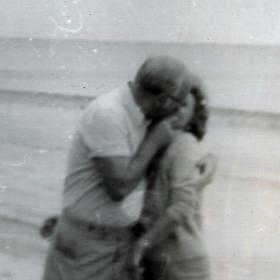 Their love was the kind of everlasting companionship, for they endured it all for 62 years. Much of Gene's legacy is in their foundation of love which produced an amazing and beautiful family tree. The newlyweds jumped right into living life to the fullest beginning the adventures of parenthood right away. In time, they welcomed 8 children into the world. Gene was a great father and worked to instill his strong work ethic into each of his children over the years. He also made time to play, as they spent many summer vacations heading up north in the family station wagon for camping fun. They also enjoyed day trips to South Haven Beach, and on colder days, they ventured to Kendall Hill for some epic sledding. Gene was not afraid to cut the rug with some smooth dance moves, as he was a great dancer. He and Cecelia would often dance together. As the family continued to grow, Gene helped to remodel the house - adding three additions throughout the years. Gene tended to the lawn and his garden as well, for he enjoyed the outdoor work. As his children matured and found adult lives of their own, Gene and Cecelia found they had more time to spend doing things they enjoyed. For Gene, that meant he would have to choose from many different passions and activities. He had a bit of a routine that kept him going and happy. He would frequent Main Street Pub where he was affectionately known as "Geno" and enjoy a beer most afternoons. Gene enjoyed his special friends, including Tim at Main Street, over the last 25 years. He loved to try his luck at Lotto , and he even hit big a few different times. He would keep informed about current events with regular reading of the newspaper, and he even enjoyed working a word search or two. 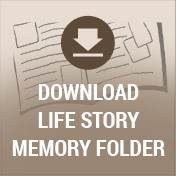 All of these cognitive exercises kept his mind fresh, as he had an impeccable memory and was always very organized while saving just about everything. On the more creative side, he was blessed with a photographer's eye and used this to take pictures of both nature and family.  Gene's life was not consumed by his fulfillment in mere self-serving satisfactions, but instead, he volunteered his time tirelessly to help others as well. He volunteered at Main Street Pub Golf outings and other events. He was also an Honorary member 4th Degree Knight of Columbus and Past Grand Knight of Council 1616. He made it his mission to collect bagels and baked goods from a local grocery store and bagel shop several times a week, then delivered them to local agencies in the community to help the needy. He also had collected and distributed more than 30,000 stuffed animals, while working with a long time friend, Alice, and delivered them to local agencies, schools, and hospitals in our community.. From counting money at his parish, to Tootsie Roll Drives, Heating Assistance, or ushering at St. Augustine Cathedral Church, he would always lend a helping hand. He would give you his shirt off his back, to anyone in need. If a person was in need of a ride to an appointment or to church, Gene offered to help drive him. Truly, helping others and volunteering was part of his DNA. Gene took good care of himself. This care afforded him the opportunity to help others, but it also allowed him to enjoy the smaller things in life. He was a charter member at the Borgess Fitness Center, exercising 4 days a week. The somewhat guilty pleasures of his love for Polish sausage (Cecelia is Polish), cigars, and favorite beverage (Pabst Blue Ribbon). He especially loved Thanksgiving, as he would cook the Thanksgiving turkey on the Weber grill, while enjoying the football game. He thoroughly enjoyed all that life had to offer him. In time, he and Cecelia were blessed with the joy of 11 grandchildren and 4 great-grandchildren. To them, he also became the rock of the family. He worked to instill his strong values and his love of living with his entire family every day of his life. After 86 years in this lifetime, Gene died peacefully on September 16, 2017, after a brief bout with cancer. He was surrounded by his loved ones in his home at the time of his passing. His selfless acts, outgoing personality, and passion for his family will forever live in our hearts. He was preceded in death by his parents and 3 brothers: Dale, Glenn and Donnie Roberts. Surviving are his wife of 62 years, Cecelia Roberts; 8 children: Cathy (Keith) Reed, Sue Newington, Richard (Deb) Roberts, Nancy (Ron) Young, Carol (Mark) VandeWouwer, Sally (Tom) Spigelmoyer, Cindy MacKenzie and Jane (Chris) MacArt; grandchildren: Andy Reed, T.J. (Lindsey) Newington, Jami (Ryan) Gumpper, Kyle VandeWouwer, Eric and Paige MacKenzie, Danielle and Leah MacArt, Heather (Dan) Mallo, Andrea Spigelmoyer, Whitney (Brock) Grant; 4 great-grandchildren: Allison, Holly, Brielle,and Finn; and many nieces and nephews. Visit with family and friends on Wednesday from 4-7pm at Betzler Life Story Funeral Home, 6080 Stadium Dr. Kalamazoo (269) 375-2900 where a Rosary will be recited at 7pm. Mass of Christian Burial will be celebrated Thursday 10:30 am at St. Augustine Cathedral followed by a luncheon in the Cathedral Center. Burial will take place at 2pm Ft. Custer National Cemetery. In lieu of flowers, memorial contributions may be made to: St. Augustine School, St. Vincent DePaul or Paralyzed Veterans of America.